Without a doubt, the use of reclaimed and recycled materials in home design has become something that designers and homeowners take seriously. To be honest, there’s just something compelling, attractive, and (dare we say it?) 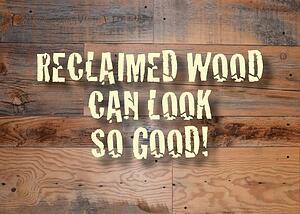 cool about using reclaimed wood and metal in the building or remodeling of a home. But like so many trends, one has to do it right in order to make it work. Reclaimed materials can add a special feel to your home. Often, a recycled item (whether it’s a door, a sink, or a stained glass window) adds intrigue to your home and is even a conversation-starter. Houselogic.com offers a fun and interesting post on 11 Clever Ways to Use Salvaged Building Materials. Some of the ideas are small and simple, while others are pretty dramatic. You might pick up an idea or two that you can use in your Naples-area home. Of course, just because something is popular doesn’t necessarily mean it’s the right direction for you. And it doesn’t mean you have to go overboard with it in your home design. You’ll want to take a look at the overall style of your home. If your home style is more modern and sleek, heavy use of reclaimed wood may not be the right direction for you. On the other hand, selective use of some reclaimed materials (whether it’s wood or metal or glass) can provide a striking contrast that’s unique to your home. What are some other things to be aware of if you’re thinking about incorporating reclaimed materials into your Naples home remodel? For this post, we’ll focus on wood. You’ll want to be careful about the source of the wood. There are unscrupulous vendors selling “reclaimed” wood that’s actually nothing but damaged wood that’s really not suitable for use. Others sell new wood that’s distressed to make it look old and reclaimed. That’s perhaps not a terrible thing—unless you think you’re purchasing it so that the wood will be recycled instead of being destroyed. Bear in mind that reclaimed wood may actually be more expensive than new wood (especially hardwood) because of the extensive (and expensive) process of preparing it to be used in building or remodeling. You’ll also want to ensure that there is no stray metal in the reclaimed wood you use. That can wreak havoc with power tools and be dangerous to workers. One big plus for using reclaimed wood (apart from it’s aesthetic appeal) is that, years ago, hardwood was generally taken from older trees that had matured. A lot of today’s hardwood comes from less mature trees and has a lower “hardness” factor. If you’re looking for a unique touch that will set your Naples home apart—and if you like the idea of reusing something that still has a lot to offer—you may want to explore reclaimed wood and other materials when it’s time to remodel. But you may want to run your ideas past an experienced designer to make sure the materials you’re getting are really what you think they are, and that they’ll work with the rest of the design in your home.